Pittsburgh, PA: The University of Pittsburgh Press, 2016. Melissa Yancy’s story collection Dog Years, winner of the Drue Heinz Literature Prize, is astonishing in the emotional range embodied in its characters. From a molecular geneticist mother attempting to create normalcy for her son suffering from a genetic condition; to a former medical poster girl navigating her identity now in adulthood; to an abused court reporter taking in lost shrimp and dogs and other wounded creatures; to a fetal surgeon finally comprehending his father’s sexuality at the end of the father’s life — these realist stories, told largely in the third person perspective, often read as nuanced portraits. Tonally some reminded me of Edward Hopper, offering readers frank, intimate access into each character’s listlessness or questioning or heartache. At the same time, an undercurrent of humor also winds through many scenes, offering counterpoint, or simply acknowledging the absurdity that exists alongside such extremes as a dying child, the inability to move forward, or an ailing father. Many stories in Dog Years explore aspects of the medical world (the fetal surgeon in “Consider This Case,” for example, or the kidney transplant patients in “Go Forth,” or the service people in “Hounds” seeking facial reconstruction). The collection’s wide spectrum of medical conditions is described with precision in terms of tone, vocabulary, and emotional tenor. Where some writers may steer toward medical oddities, perhaps offering a leering gaze or even a magical or surreal treatment of the material, Yancy’s book, instead, seems to carry a real curiosity about how a person may live within each set of circumstances, what flavor of suffering they may endure, and how they might cope or overcome. Looking at thematic movements, readers might also trace a dog or pet motif throughout, including the description of Peter in “Teeth Apart” (“Her husband, who is as loyal, athletic, and bright as a dog”), the sick boy in “Dog Years” measuring his own life by a canine calendar, and the much-aged beagle in “Hounds.” Many examples abound in these pages, and the idea of “taking care” seems to be the overarching dynamic — applicable to the parent-child, surgeon-patient, and pet owner-pet relationships. While some stories focus on self-care, most of the narratives revolve around one character taking care of another, or attempting to, and the connections and disconnections that result from the attempts. Throughout this collection, Yancy skillfully manipulates the narrative action on multiple planes, shifting focus so that a story’s shape feels balanced, not lopsided, the various elements woven into a resonant whole. For example, in “Consider This Case,” which won The Missouri Review Jeffrey E. Smith Editors’ Prize, the narrative shifts effortlessly between the surgeon protagonist’s complicated hospital life and his domestic realm, now occupied by his terminally ill interior designer father. Both narrative planes have a magnetic, dramatic pull, and together work in satisfying conversation with each other. This sense of wholeness, found in this and other stories, may be due to the writing’s generosity and Yancy’s attention to detail; even the lesser threads within these narratives are given room and import, rather than relegated strictly to the background. Throughout the collection, Yancy employs sharp yet lush details to create the tangible specificity of these characters’ apartments and labs and self-help meeting rooms. At the same time, she keeps the narrative machinery understated, allowing for hint and intimation in place of blunt telling. The subtlety invites the reader in. Perhaps what’s most arresting about Dog Years is Yancy’s ability to create the quiet within each character — the moments of hesitation, of disappointment, of silent resolve — with such beautiful, understated exactness. In “Go Forth,” for example: “Beverly did not know what she would do with this feeling, this imperative to commence, but already she feared that the execution of it would be small.” Or in “Teeth Apart”: Laura “has decided to make Davos a space outside of space, and allow herself to drink, to smoke, to eat fat little sausages.” Similar interior windows, and compelling intimacy, emerge in all the stories. In “The Program™”: Lynn “couldn’t trick herself forever. She would have to learn to fight inertia the same way she indulged in it, in tiny shuffling increments.” Or in “Stray”: “Lily had wondered how other people seemed able to quiet their minds. But now she began to consider that they kept out the noise by letting something else in.” While occasionally humor tempers the presentation of characters’ loneliest or starkest thoughts, the loneliness and starkness are not completely erased. Yancy excels at creating vulnerability in her characters and depicting it with compassion, while serving it to readers with sometimes a wryness or familiar nod. 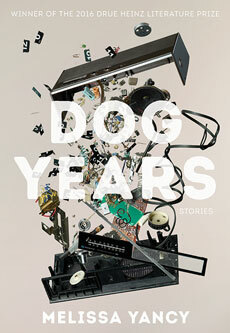 Overall, Dog Years is a rich, smart, and humorously moving collection of stories that answers Faulkner’s Nobel Prize call for writing to engage with “the human heart in conflict with itself.” That these characters are conflicted is obvious. Yancy artfully articulates their maneuverings through her poignant and nuanced exploration of the interior. Waxwing published Yancy’s story “Shafted” (not included in the book) in a previous issue. Read it here.